The Rocky Mountain Land Library is working with Park County, the South Park National Heritage Area, and the City of Aurora to locate a majority of our books and educational programs at South Park’s Buffalo Peaks Ranch, on the banks of the South Platte River. 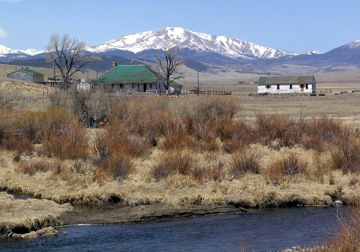 This historic ranch presents the Rocky Mountain Land Library with the opportunity to establish a residential land-study center for the southern Rockies. We are also excited to be working with the South Park National Heritage Area nationally recognized effort to preserve the natural and cultural history of a truly unique Western landscape. Buffalo Peaks Ranch will provide both quiet and inspiration for lifelong learners of all types, including artists, writers, naturalists, scientists, and students at all levels. Everyone will have access not only to the Land Library 32,000+ volumes, but also to South Park’s surrounding landscape of high mountain grasslands and alpine summits. I am a trained educator, interpreter, outdoor enthusiast, reader, lover of words, books, the Rockies; how can I be part of this? Please? Thanks Julie — sorry to be away from the computer — let’s get in touch at jeff@landlibrary.org! I’ll check you out next spring/summer. I think your idea of this place is great. Maybe I’ll retire down there and help out! Which will be in 4 weeks! Let’s keep in touch Colleen!! I think this is a very important effort and hope to be able to be involved also. Young people could really benefit from this land/library. Thanks so much Lynn — and YES! we have many great books for kids & young adults too!